Do games mean the world? Can games make a better world? Can new forms of participation be made possible through gaming and gamification? Can the culture technique of gaming have an impact on the development of cities and countries? Goethe Institut’s project “Enter Africa” aims to develop a game that deals with the city’s issues of the future, since the future of the present world is being decided in particular in major cities. Approximately 18 new megacities are expected to develop in Sub Sahara Africa by 2025, associated therewith are challenges to infrastructure, resources and culture. These are cities like Lagos (Nigeria), Bamako (Mali) or Dar es Salaam (Tansania), which are among the fastest growing cities of the continent. Last mentioned counted an estimated 5,5 million inhabitants in 2017, by 2030 there will be already 10 million people. First mentioned already holds 21 million people today. By 2050 it will be twice as many. Megacities as a challenge, that affects the entire continent. Unsurprisingly, Goethe Institutes across the continent are involved in the development of the game: Addis Ababa, Kampala, Dar es Salaam, Kigali, Windhoek, Johannesburg, Nairobi, Ouagadougou, Kinshasa, Lomé, Abidjan, Dakar, Yaounde, Accra and Lagos. Young teams of architects, city planners, engineers, IT experts and creative artists come together to create visions for their cities with the help of analogue and digital game development. At the end of the process stands a common, transnational, digital mega game. It will be presented at Gamescom 2019 in Cologne, the largest European games fair. 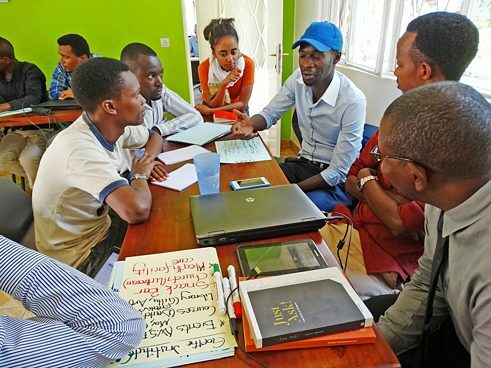 In Kigali, the group consists of about ten participants, who are experienced in the fields of teaching, game design, architecture and IT among other things. They meet weekly to devote themselves to the topic of "Public Spaces". In places of public life such as the Kigali Public Library, the central bus park or the mountains surrounding the city, the player has to complete the tasks later on and thus get to know his own city at the same time.